Pre-existing conditions like CF can't disqualify you for insurance. Wahooo! Annual and lifetime spending caps are no longer allowed--an important issue when your entire life involves medical care, hospitalizations, and perhaps lung transplantation. Medicaid will be available to more people. If I remember correctly, about a third of the CF community here in Atlanta is on Medicaid, which means that there already is a huge need in the CF population for assistance. 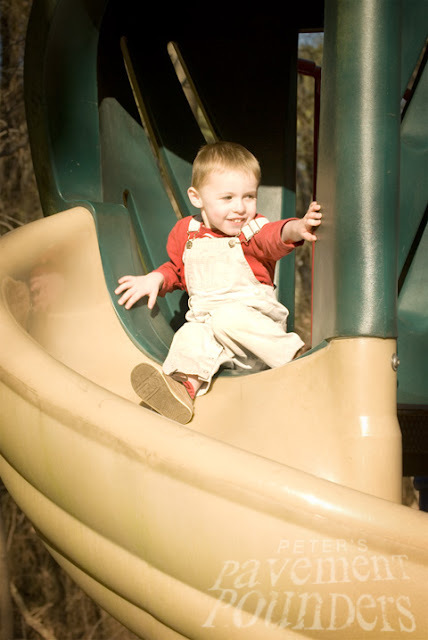 Children can stay on their parents' insurance up until age 26. This one makes me so happy. With Peter's CF, he may not be able to go to college full-time, and this gives him time to go to school, serve a mission, or travel before settling down and getting a full-time job with (absolutely necessary) health benefits. Of course, what Peter decides to do with his life and how to pay for his medical needs will ultimately be his responsibility, but right now, it is ours. So we're trying our best to make smart decisions about our money, bills, and keeping our costs down, including tracking all of our medical bills and receipts so we can get them reimbursed through our Flexible Spending Account (FSA). The other day, while I was working on submitting FSA claims, I heard a ripping sound. 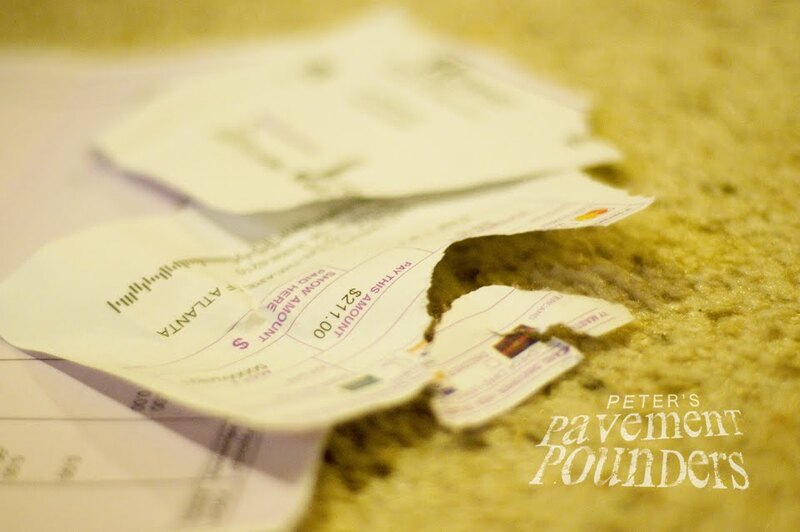 I turned around and there was Peter with a Children's hospital bill that he had taken a bite out of! You can even see his teeth marks in the picture. I'm glad I got it away from him before he got any farther! After all, I'm not sure the hospital would believe me if I told them I couldn't pay my bill because my toddler ate it! 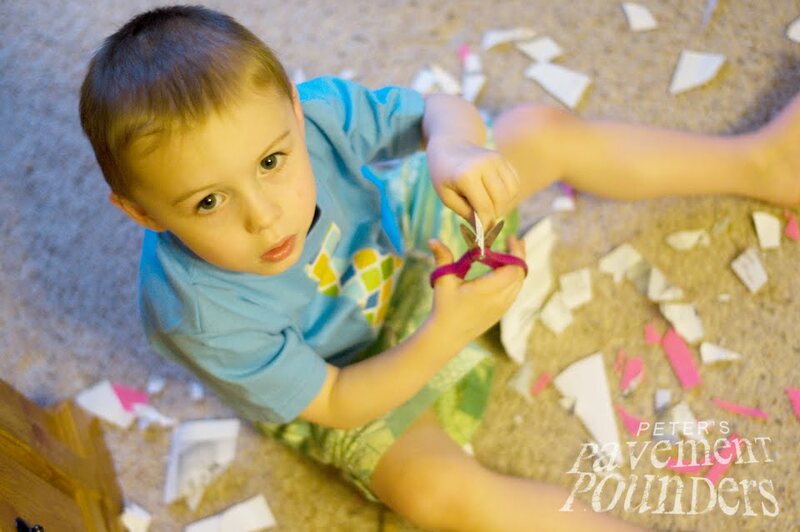 FYI: Peter was just as content to cut paper as to eat it, so I got him some supplies and he filled the floor with scraps while I worked. 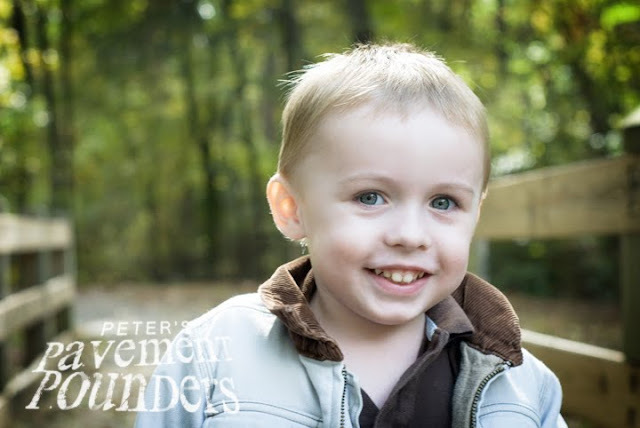 When you look at a healthy CF child like Peter, it's hard to believe that he has such a serious disease. But it is serious, and there's real life-and-death consequences to the treatments, medication, research, and progress that has to be made. Tonight I read that Eva Markvoort, a 25-year-old college student and subject of the documentary 65_RedRoses, passed away on Thursday. A simple entry in Eva's blog reads: "Our beautiful girl died this morning at 9:30. She is at peace." Although I have not seen the film, I have been deeply touched by Eva's blog and her bravery facing the worst of cystic fibrosis. With Eva's death, I can't help remembering another who died of CF, my cousin Katie. 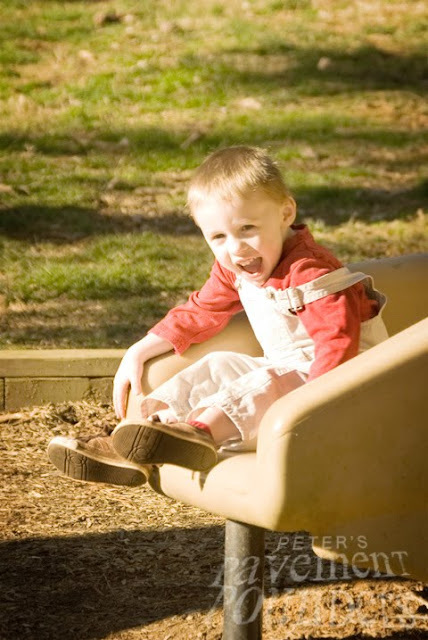 Katie was an artist and a mom, enthusiastic about life and fighting CF. I was pregnant with Peter when Katie died. She was 29. So tonight I'm sending out a little prayer of comfort for Eva's family. I'm also remembering my funny, sweet cousin, and feeling a little more urgent about finding a cure. 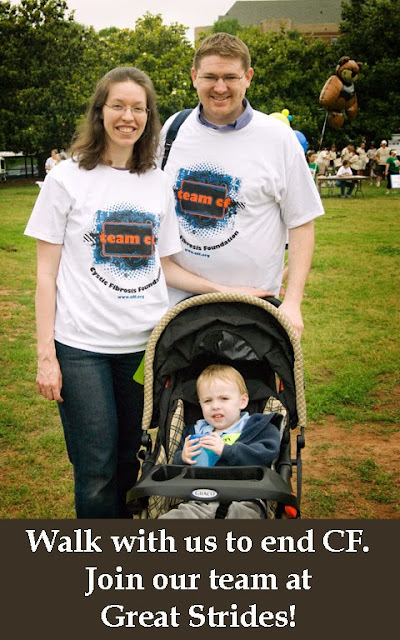 At Great Strides last year, one of the team's t-shirts said, "He who goes before you will himself fight for you." Here's hoping the fight ends soon. Have a blog? 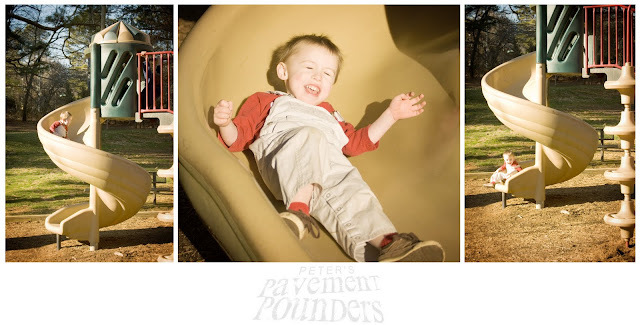 Feel free to copy photos or share videos from our site of to share about Peter. Then, please let us know! We'd be happy to feature your blog posts here! FYI, Our Atlanta team total is up to $280 in donations! Awesome! We are on our way! One of the most important treatments Peter does everyday is his "Vest," a machine that pumps air into a life-jacket-like vest and pounds the chest to loosen mucus in his lungs. Peter is prescribed a 20-minute treatment in the morning and at night along with nebulized medication he breathes while doing the Vest. Here's our little guy doing his treatment only a couple days ago. He is awesome at it! The first time, though? Not such a happy camper. 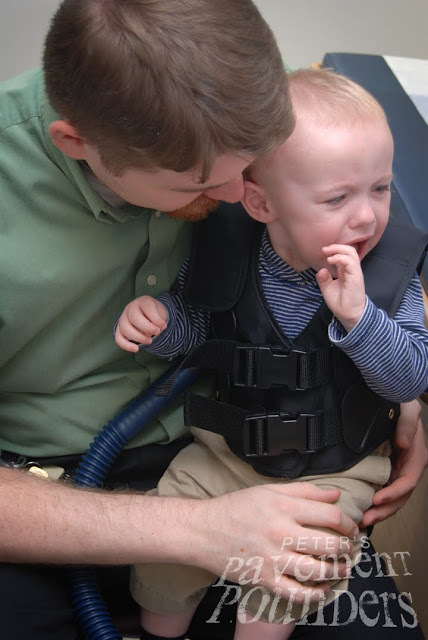 At CF clinic, Peter's first experience with the Vest was a bit traumatic. Poor guy! 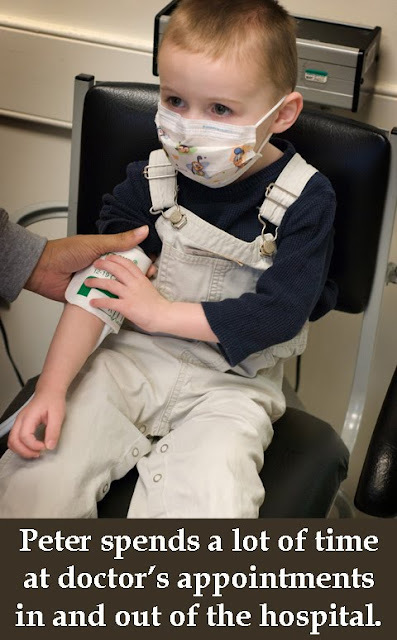 One of the hardest parts about being a CF parent is having to subject your child to scary and often uncomfortable medical treatments. But the alternative--allowing Peter's lungs to get junky and infected--is worse. So we do what we can to prevent that, even though it may make us (or him) upset. At our first clinic appointment after Peter was diagnosed, our respiratory therapist fit Peter with the Vest and showed us a sample treatment. Peter was not happy about it! "Snugs" from Daddy really helped. 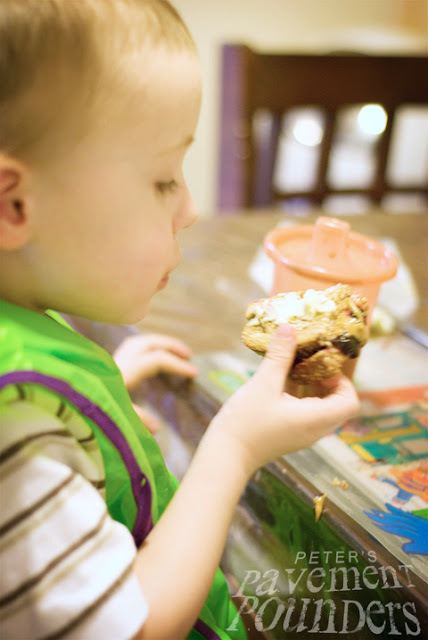 Just feeling really lucky to be who I am today: a mom of a fabulous little boy, a babysitter of a sweet little girl who has become like a little sister to Peter, and a photo-nut who loves pictures, but doesn't have enough time to edit and share all she wants to post. P.S. We need more fans on Facebook! Become a fan! I have been sending out some thank you emails to people who have decided to join our team or donate to our CF walk! Woohooo! 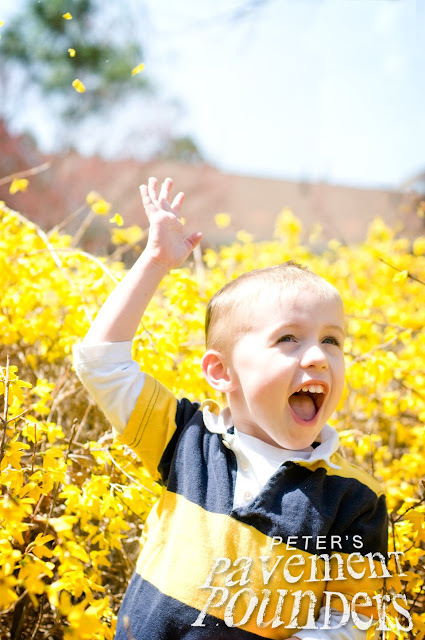 With only three donations, our Atlanta team has $75.00 to donate to the CF Foundation, and we have at least 7 more people who have said they want to join our Atlanta team. Thanks a lot! Let's keep it going. 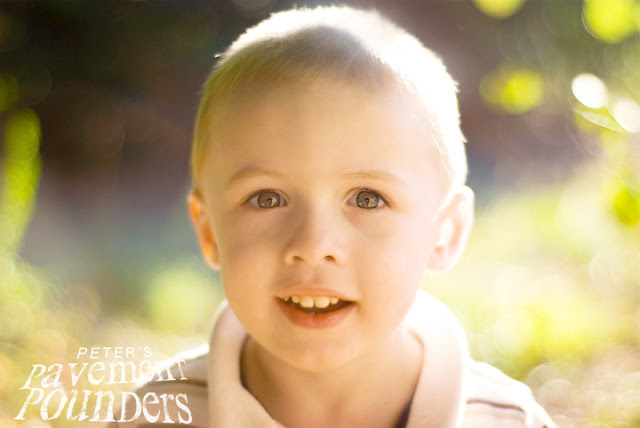 You're helping this little guy live a longer and better life. 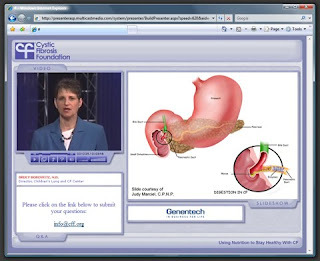 People with cystic fibrosis need extra calories, LOTS of extra calories! We always have a lot of butter, high calorie nutrition drinks, and other high-fat items in our house. 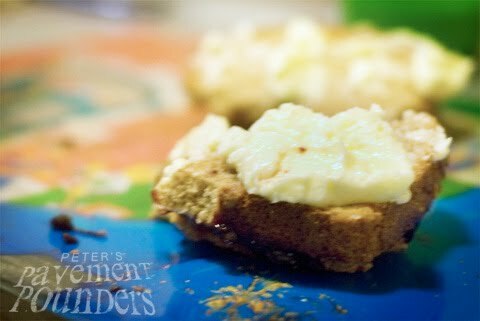 I made Peter a peanut butter and jelly sandwich (which I usually butter heavily before putting on the spreads), but this afternoon Peter decided he needed more! So, here's his creation: PB&J . . . &B (peanut butter and jelly and butter)! 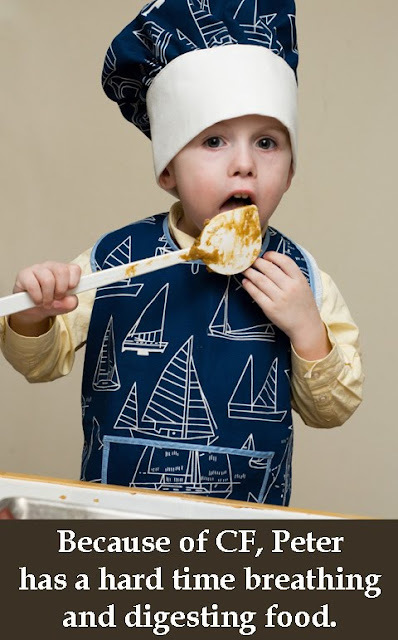 Why do people with CF need more calories? 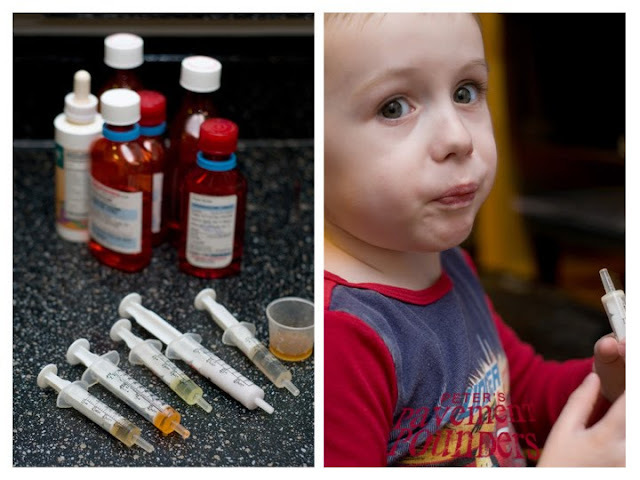 Even with medication, a CFer can't absorb food as efficiently as a person without CF. So, extra calories are needed to get a regular amount of calories into the body. Also, CFers are burning more calories just with normal body functions like breathing. Peter, like others with CF, has a hard time gaining weight, so we are trying our best to get his BMI to the 50th percentile or higher. Better BMI (even a little too heavy) makes for bigger lungs and better lung health. So, on with the butter! Let's grow those lungs! Happy birthday to my little sweetheart. Daddy and I talked about how neither of us remember as far back as three, so I thought I would write a little about you. You have daddy's perfect hair and long dark eyelashes. You have Mommy's eyes and enthusiasm. Your smile lights up a room. You are great at talking and explaining yourself, though you still have trouble with some sounds like "th." Some of your favorite things to say are, "I do it." "I fink it's my turn." and "Goodnight ev'rybody-guys!" 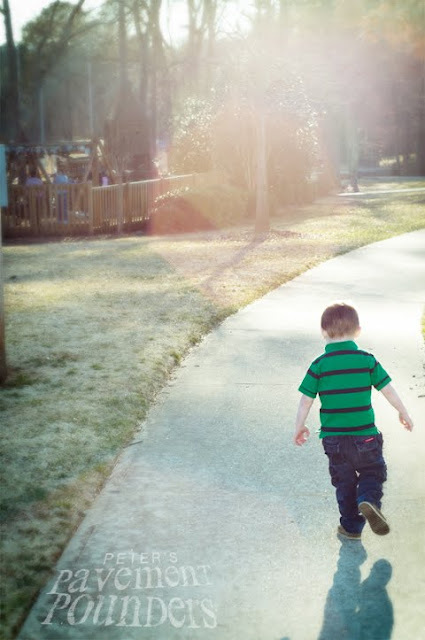 Your favorite game is "run around," which is just like it sounds: you love to run around, inside or out, at home, at (ahem) church, or at the park. Candyland and "Match" (with Memory cards) are also favorites. We've started to learn our letters and sounds ("the Learning Game") during the week. You've gotten accustomed to doctor, dentist, and CF clinic visits. You're generally good about doing your treatments and taking your medicine. People are always surprised to learn that you have CF; you look like such a healthy boy. Your favorite food is Snyder's pretzels and "chocolate milk" (any type of nutrition drink.) You also like tuna fish sandwiches, burritos, macaroni and cheese, hummus, waffles, and french fries. The only vegetable you eat with any type of consistency is carrots. This year will be a big one for us. 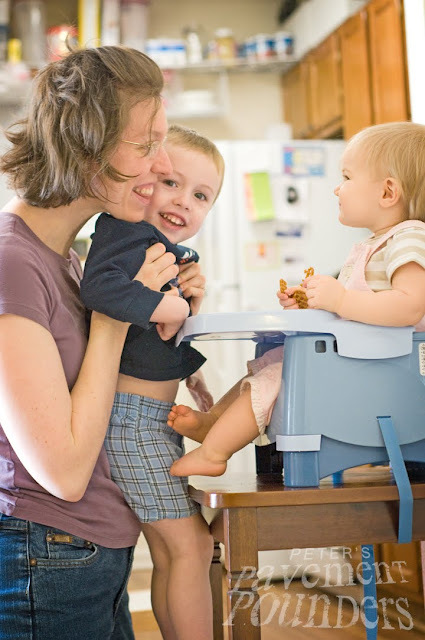 You will continue learning to share, and to be a "big brother" to the little girl we babysit. We will also learn how to swallow pills, start some basic reading, and have fun doing more swimming, sports, gymnastics, and cooking. And of course, we will continue running! Heavenly Father sent us a wonderful little buddy. 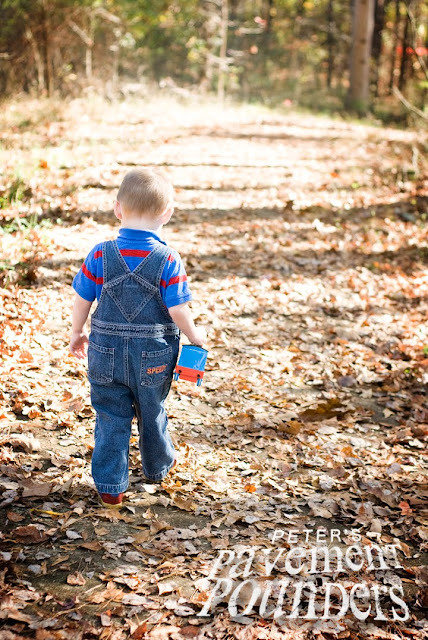 I am so excited to see you grow and learn this year. Happy birthday! P.S. 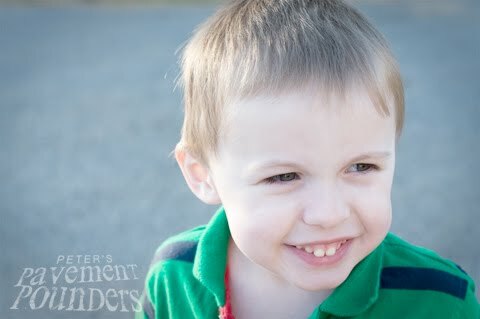 Daddy took these photos of you this week while I was doing a shoot with a friend. Boy, he sure loves you! Welcome! 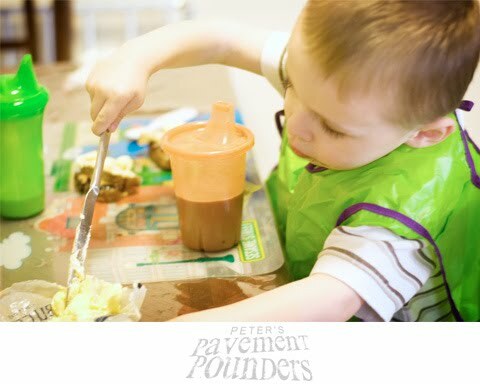 Today is the official launch of peterspavementpounders.org and we are so thrilled you're here! 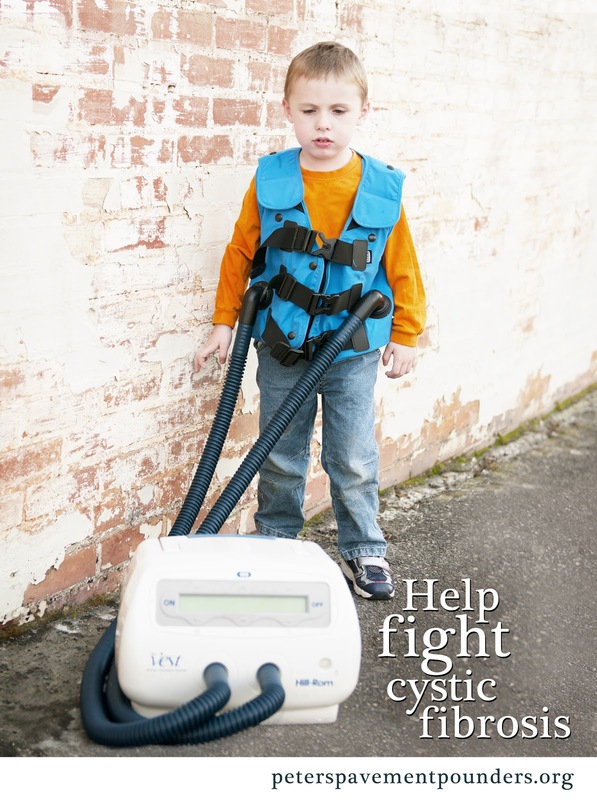 We hope you'll be touched by our experience and will want to join the cause to "pound out CF!" An easy-to-understand set of cards for display or for explaining CF to kids. This year, I have joined their national team of walkers, Peter's Pavement Pounders, for the Great Strides CF walk on (Date), (Time of Walk) at (Location). 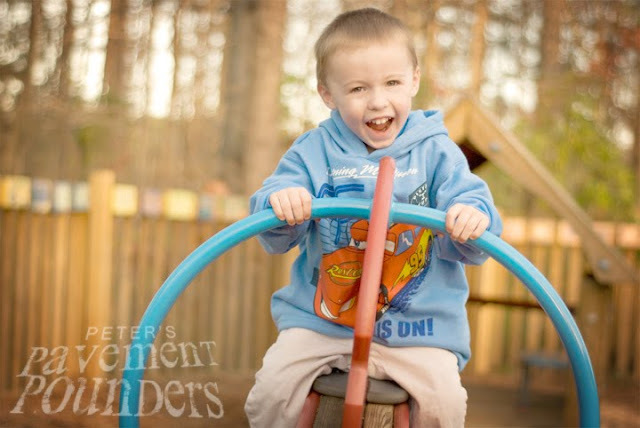 The funds we raise for the Cystic Fibrosis Foundation will help find new treatments, medication, even a cure for Peter! 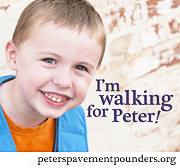 If you are interested in joining our team, or in joining Peter's Pavement Pounders at a Great Strides walk in your area, see the "Walk with Us!" page on peterspavementpounders.org for more information. 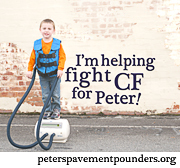 We would love to have you help us "pound out CF!" 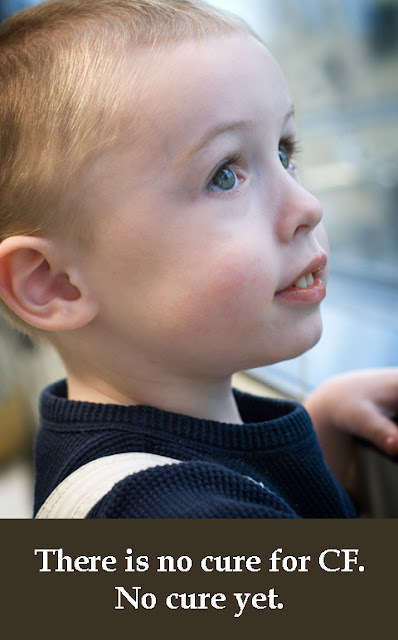 This is our family's CF story including diagnosis and daily life with a disease that has no cure, not yet. 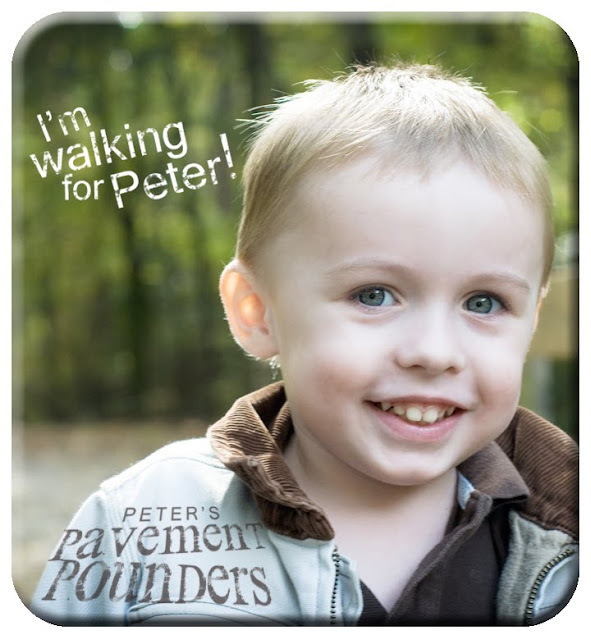 Please walk with us to end CF or make a donation to our team, Peter's Pavement Pounders. Vest and Neb Treatment from Marchet Butler on Vimeo. 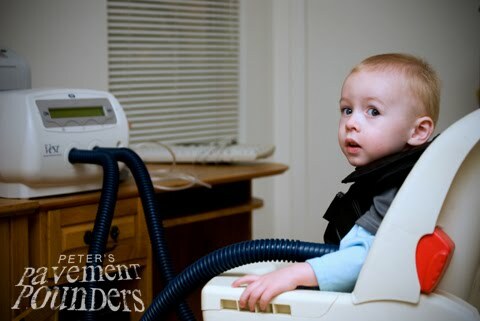 Our little CFer's Vest and nebulizer treatment. When he is well, he does this twice a day for 20 minutes each. 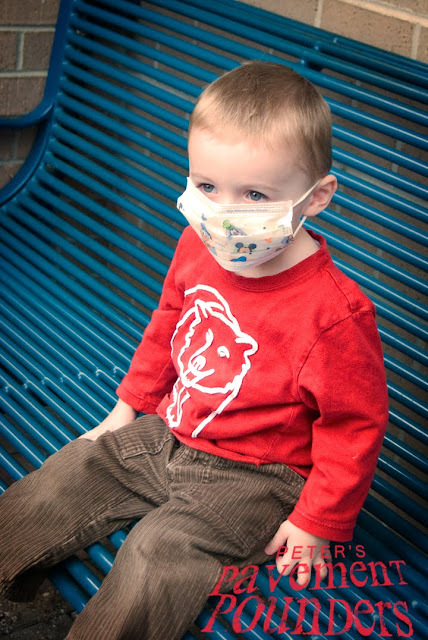 When he has a cold or other respiratory infection, he does up to 4 treatments a day for 20-30 minutes per session. 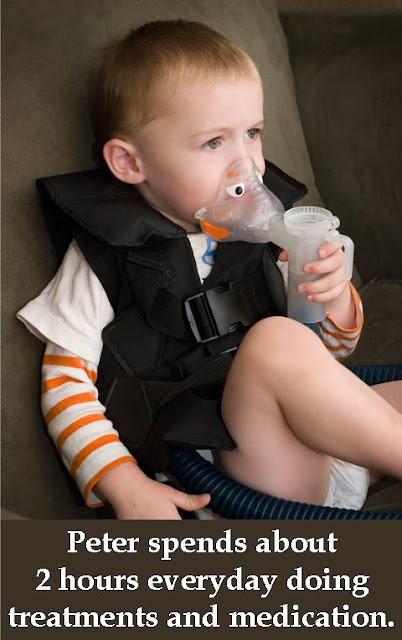 The Vest helps loosen mucus from the lungs and the nebulizer contains a medicine that helps thin the mucus in the lungs. 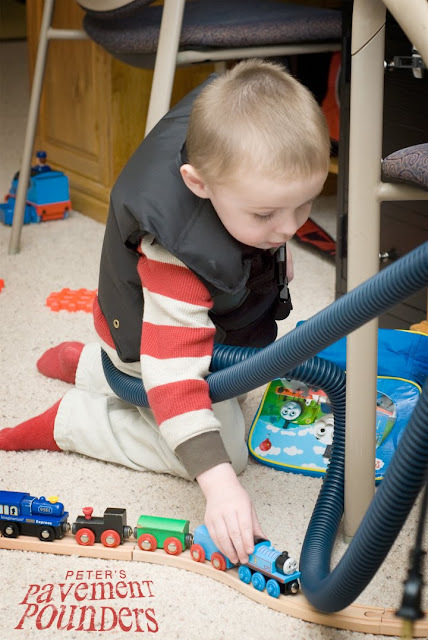 A train fan--even while doing his Vest treatment!